This simply superb Lake District self-guided walking holiday will take you through the heart of the Lakes from the southern capital of Ambleside to the northern capital of Keswick. In between you will stay in the beautiful Langdale Valley, the perfect base from which to explore the best mountain walking the Lake District has to offer. We arrange comfortable accommodation in en-suite rooms at hotels and accredited guest houses on your route and we transfer your luggage between each of the three bases for this tour. On this holiday you can choose to spend 2 or 3 nights in any or each of the three locations. Option A (easy): Wray Castle and lake shore path to Bowness (requires £20 for combined castle entrance and Windermere ferries). 4 miles. Negligible ascent. Option B (moderate): Traverse Wansfell to Troutbeck/Town End and return by an old drovers road. 6 miles. 1885ft. Option C (hard): Ascent of Red Screes by its SW ridge and return via Scandale Valley. 7½ miles. 2450ft. Option D (strenuous): The classic round of the Fairfield Horseshoe.11 miles. 3530ft. Option A (moderate): Via Loughrigg Tarn, Skelwith Bridge and Elterwater. 7½ miles. 1200ft. Option B (hard): Via Loughrigg Fell, Red Bank and Silver How. 7½ miles. 2470ft. Option A (easy):. Follow Stickle Gill to Stickle Tarn below the cliffs of Pavey Ark. 3 miles. 1260ft. Option B (moderate): Ascent of Pike O'Blisko. 4.5 miles. 1960ft. Option C (moderate):Ascent of the Langdale Pikes. 4 miles. 2470ft. Option D (hard): Traverse of Crinkle Crags. 6½ miles. 2925ft. Option E (hard): Traverse of Bowfell. 7½ miles. 2875ft. Option A (moderate): Via Stakes Pass to Rosthwaite and then bus to Keswick (approx. £3). 8 miles. 1700ft. Option B (hard): Via Stakes Pass and along the River Derwent and Derwentwater shore. 16 miles. 2300ft. Option C (hard): Via Esk Hause and Seathwaite. 16 miles. 3150ft. Option D (strenuous): Via Esk Hause, Allen Crags and Glaramara. 16 miles. 3650ft. Option A (easy): A short circular walk taking in the viewpoint of Castle Head and the lake shore. 2 miles. 325ft. 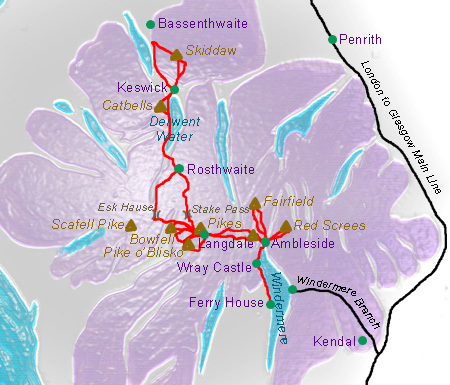 Option B (moderate): Circular walk via Walla Crag and Ashness Bridge. 6½ miles. 1400ft. Option C (moderate): Cross the lake and ascend Catbells ridge (requires £3.50 for Keswick Launch). 7½ miles. 1500ft. Option D (hard - strenuous): Ascent of Skiddaw with route options from 7½ miles to 9½ miles. Approximately 3200ft of ascent. The nearest railway station to Ambleside is at Windermere, a branch line of the main North-West London to Glasgow rail link (change at Oxenholme). From Windermere there are taxis and a regular bus service to Ambleside - a journey of 5 miles. Alternatively, if you are arriving by car we can arrange parking in Ambleside (possible extra charge). The nearest railway station to Keswick is at Penrith (16 miles) on the main North-West rail link between London and Glasgow. 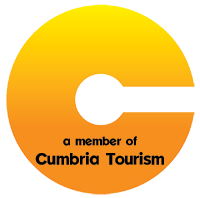 From Keswick there is a regular bus service to Penrith which stops at the train station or we can arrange a taxi for you. If you have left a car at Ambleside the easiest way to return is by bus (50 minutes) or we can arrange a taxi for you. On this holiday we use three different bases for walks at Ambleside, Langdale and Keswick. You can choose to spend 2 or 3 nights in any or each of these bases and we provide various walk options for each day ranging from relatively easy or moderate walking, to strenuous hikes taking in the Wainwright summits of the area. On the two days where you walk from one base to the next, there are also route choices which will include at least one moderate option. You can mix and match the options to make your holiday as easy or as challenging as you like.